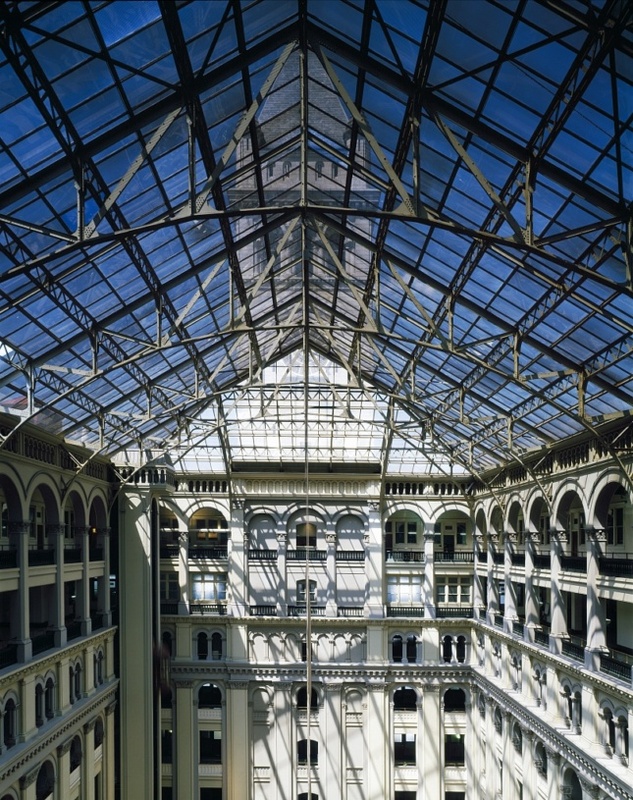 Old Post Office, Washington, D.C. [Between 1980 and 2006], Photograph by Carol M. Highsmith, Library of Congress Prints and Photographs Division. The Trump International Hotel is no longer the only attraction at Washington, D.C.’s Old Post Office Pavilion on Pennsylvania Avenue. 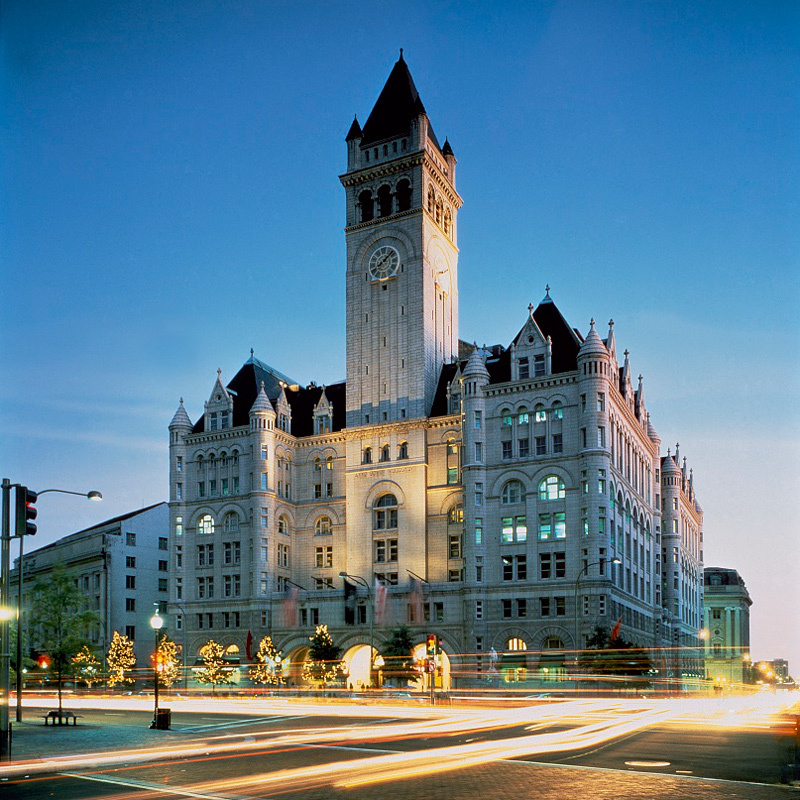 The National Park Service has resumed public tours of the Old Post Office clock tower, three years after they were suspended so the Trump Organization could start construction on the $200 million, 263-room luxury hotel that opened last fall. Visitors can once again go up inside the 315-foot-high clock tower for sweeping views of the city. It’s the highest public vantage point in the nation’s capital, with the Washington Monument closed for elevator repairs for at least another year. Built from 1892 to 1899 to house the U. S. Post Office Department Headquarters and the city’s post office, the Old Post Office occupies an entire city block at 1100 Pennsylvania Avenue N.W. It was designed by Willoughby J. Edbrooke, in a Romanesque Revival style, and was the first steel-frame building constructed in Washington, D.C. The central clock tower has an observation deck with arched openings that frame views of the city. Inside the Old Post Office Building, Washington, Photograph by Carol M. Highsmith, Library of Congress Prints and Photographs Division. The building served as the U. S. Post Office headquarters until 1934. For the next four decades, it housed a variety of federal agencies. During the 1960s, it was the headquarters for the wiretapping unit of the Federal Bureau of Investigation, an agency that President Donald Trump just accused of tapping his wires at the Trump Tower in New York. It also has been the headquarters of the National Endowment for the Arts and the National Endowment for the Humanities, two agencies that may be eliminated by the Trump administration. Under the Cooperative Use Act of 1976, it was opened to a mixture of public and private development. Now that the hotel is open, visitors to the clock tower have to enter through the building’s south side, off 12th Street N.W. Tour hours are Thursday through Sunday from 9 a.m. to 5 p.m., and the last entry is 4:30 p.m. Tourists won’t necessarily interact with the hotel guests or management; the clock tower tours are run by the park service. National Park Service Washington, D.C.